Interview by George Nott, published in the Enfield INDEPENDENT on 30 August 2012. On a rainy Bucharest night in 1970, Elena Oprea, a waitress, was making her way home from her shift. Entering the courtyard of her housing block at around 2am she heard footsteps behind her in the darkness, and a man’s voice. She screamed and was struck by a metal rod across the head. Elena was stabbed several times and cried for help as she was bludgeoned to the floor. Neighbours, woken by the commotion, eventually dragged her inside and called an ambulance as the attacker made off into the night. Hours later she was dead. Elena was the first victim of Ion Rimaru, Romania’s most notorious serial killer. He would go on to attack 14 more women before he was eventually caught. Four were killed, many were raped, others were mutilated. In some cases he ate their flesh – biting out their genitalia and sucking their blood. But how did he evade capture for so long? 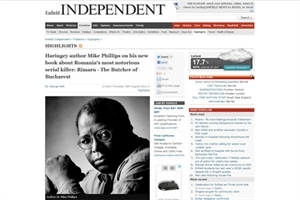 A new book by Haringey author Dr Mike Phillips, Rimaru: The Butcher of Bucharest, suggests the communist regime of the era, a state-ruled media and the inefficiencies of the authorities helped create a ’perfect storm’ in which Rimaru’s evil could flourish. By the time he attacked his second victim, Florica Marcu, who was knocked unconscious outside her home and dragged to a cemetery where she was raped, stabbed and had her blood sucked, rumours were already circulating the streets. There was a vampire in the night, a bloodthirsty killer on the loose. But the newspapers didn’t cover the story at all. “The state-ruled media was full of propaganda,“ explains Mike, “and the censorship did not encourage articles about criminals and law breaking – it was considered that in a socialist society there were no crimes and no criminals, or at least such events were rare and not done by the working people. This, coupled with the reluctance of citizens to talk to the police, meant Rimaru evaded capture for many months. As a child, Rimaru had shown signs of violent behaviour and his childhood had been troubled, which is documented in the book – but his tendencies were never noted or taken notice of. Through the sterling detective work of an out-of-town Militia (Police) Colonel, who is tracked down and interviewed in the book, Rimaru was eventually brought to justice but his story, though rarely talked about in Romania, was not quickly forgotten. Rimaru - Butcher of Bucharest is a fascinating read, full of detail, that frames a factual account of the crimes within their social environment, while examining their impact on the culture, and their lingering legacy in the present day.